Bringing a pet to its new home can be scary and confusing as he or she adapts to their new environment. This can be significantly enhanced if there will be another pet in the household too, who may also be unnerved by the situation. It can actually be easier to integrate cats and dogs, who are less likely to see the newcomer as a competitive threat compared to other cats and dogs. Here are some tips for introducing cats and dogs to other another. Establish a “safe” room in which your cat can feel comfortable away from your dog. This should contain his or her litter tray and bedding, and will ultimately be a place for your cat to sleep, eat, toilet and escape for general sanctuary once both pets have been formally introduced. Before both pets meet, help them get used to each other’s scents via used bedding, grooming with the same brush and stroking both pets without washing your hands. This will make the introduction a little less bewildering. It’s also a good idea to feed your cat in areas that your dog cannot reach (such as on counters) or in areas that your dog cannot access. During the first meeting, you may prefer to crate your dog so that your cat can make contact on their own terms. This prevents the possibility that your dog will scare your cat with overenthusiasm or aggression. Expect plenty of hissing and spitting from your cat during the initial introduction but this tactic will ensure that they cannot get into a physical fight. End the meeting if things become aggressive or emotional and try again when the situation is less fraught. If you would rather have your pets meet face-to-face, it’s best to keep your dog on a lead (especially if he or she is easily excited or prone to becoming aggressive) and encourage him or her to sit quietly while the cat approaches at his or her own pace. Some dog breeds are naturally inclined to chase and will need some guidance and patience until they understand that any cats in the household are not part of this “game”. If your dog behaves well during the first encounters, offer rewards so that he or she is more inclined to stay still and quiet. 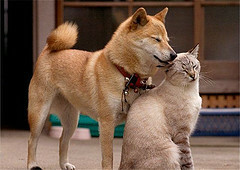 This should help your dog to associate the cat with receiving rewards for calm behaviour. If your dog is particularly energetic and excitable, try going for a walk beforehand to burn up some excess energy. Following a successful encounter, repeat the meeting several more times before giving both pets free reign in the house. Avoid leaving them alone together until you can be sure that they are truly comfortable with one another. Until this point, the “safe” room can continue to offer an escape route for your cat, especially when you are not around. Do you have any additional tips for helping cats and dogs to get off on the right foot? Share your thoughts in the comments section below!